The tio Marine15 is a new brushed speed controller designed specifically for use in RC boats that allows for the use of Lipo battery packs as well as the usual NiCAD/NiMH/Lead Acid that are more commonly used. It has a 15Amp motor limit, what this means is that you can use any, DC brushed motor, as long as the current drawn by that motor does not exceed 15Amps under load (with the prop connected, under water). The tio Marine controllers also feature the new 4 quadrant control system that stops the motor completely before turning it in the opposite direction. This allows for perfectly symmetrical operation about the neutral position in both directions, allowing the modeller to achieve perfect slow control in all situations. Another feature of the tio Marine controllers is the ability to turn reverse on or off. This is done easily by a single press of the set button, allowing you to use the controller in forwards and reverse or forwards only mode. 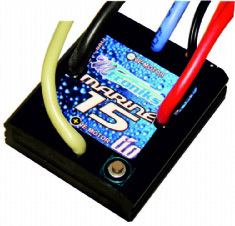 The Marine15 is the perfect speed controller for anybody wanting to upgrade their old speed controller for a no nonsense 15Amp reversible electronic speed control or for anybody who uses scale model RC boats at scale speeds. The Marine15 is fast becoming a popular choice from the new line of tio marine speed controllers, this is due mainly to all the features that are included, such as a built in failsafe, 100% proportional, fine throttle control in both directions, and motor stall protection, which is a feature that cannot be overlooked when a possible encounter with weeds is always just round the corner. Not to forget that the Viper Marine range of speed controllers are all completely 100% waterproof and designed to work on fully charged 12V Lead Acid batteries or a fully charged 3S Lipo pack. -Sealed lead acid battery (6 - 12V nominal) Fully charged 12V can be around 13.2Vwhich is ok.